The difference between Steve Jobs and Bill Gates was wrapped around their necks. Throughout the 1990s, when the pair were at loggerheads to own the home computing industry, Apple’s impresario presented a succession of groundbreaking designs wearing his trademark Issey Miyake roll neck. At Microsoft, Gates wore V-neck knits with all the elan of an Excel spreadsheet. Thus has it ever been. Fashion loves to keep a man guessing, but for a long time now the one thing you haven’t had to agonise over is your neckline. The rule was simple: crew necks are good; V-necks are bad. Depending on its depth, the V was exclusively for part-time golfers or full-time LADS. So consider us v. shocked to see the humble V-neck making it presence keenly felt both on the runway and on a slew of male celebrities, including Ryan Gosling and Donald Glover. “Though the crew neck has dominated menswear for some time, we’ve seen a shift towards the V-neckline recently,” says Simon Chilvers, menswear style director at MatchesFashion. “Prada and Lanvin have championed this look, worn layered over shirting or simply under a blazer.” Both tapped a change that had been slowly percolating for a couple of years, with Raf Simons’s oversized cricket sweaters and Gucci doing some frankly unwearable things with sweater vests. But suddenly, they’ve become fashion without the capital F.
“Entirely unassuming, but ultra-desirable, the V-neckline is a building block of a classicist wardrobe,” says stylist Eric Down, who has dressed the likes of David Gandy, Tinie Tempah and Chris Hemsworth. Aside from being technically passe, it also embodies that odd tension where something is so unfashionable that it becomes fashionable again (case in point: bum bags). “The V-neck reflects a desire for more normcore dressing,” says Down. “In an age of such global political uncertainty, it is unsurprising that fashion turns to the familiar and the comforting.” And nothing’s more comforting than knitwear. Of course, the risk with the V-neck – alongside corduroy, quarter-zip fleeces and ugly trainers – is that without at least some flair, you risk looking like your dad, rather than being ‘inspired by’ him. Hence why the latest versions of this divisive jumper style aren’t just luxed-up versions of those that fill the fustier sections of any department store. It’s also effortless. Menswear en masse is loosening up and this reinvention of the V-neck taps into that movement. Just look to the early adopters of anything that’s destined to become a menswear ‘thing’. Gosling wears his V-neck sleeveless over a T-shirt, while Childish Gambino has recruited the V-neck sweater under a suit more times than we can count. Which means it’s settled: the V-neck has been wrought from the clutches of bad taste, maybe for good. The new rule of V-necks is that there are no rules. They’re not just for Bill Gates and golf clubs, or at the other extreme, Michael Douglas gyrating his way around Sharon Stone in Basic Instinct. The V has won an unlikely fashion victory. And the opportunities to wear one are boundless. Here are five of our favourite ways to style them this season. Long the go-to for SpAds and the only guy at work who knows how to fix a paper jam, a V-neck is more than just a way to warm up when you’ve got to wear a suit to work. Just don’t be tempted to colour too far outside the lines, literally – V-necks may come in a rainbow of shades, but it’s best to keep things basic and let the neckline do the lifting. “Classic combos of white cotton shirts and grey or navy sweaters with a well tailored trouser will never fail,” says Down. One of this season’s easiest ways to look fashion-forward is to pair its two trending necklines: the roll neck popped out from beneath a V.
“Anyone can pull this off, but it is quite a 1970s vibe,” says Down. “For a modern take, go full Jil Sander with an icy cream or white colour roll neck under a blue or grey V-neck, without accessories and over grey wool trousers. For something a bit more tongue-in-chic, clash a mustard roll neck with a maroon V-neck and sling a brown leather blouson on top.” Just be prepared to fend off the odd Alan Partridge comment. If that all feels a little too geographer teacher for you, consider toughening up the V-neck with a leather biker jacket or wool overcoat. The former helps steer the once IT-department staple in a more casual, rebellious direction; while the latter in a houndstooth or check can break up flat colours and add add a touch of personality. The V-surgence is at least partly thanks to David Beckham and his co-ownership of heritage brand Kent & Curwen. The British label invented the cricket sweater in the 1930s and kickstarted the first V-neck trend. Eighty-odd years on, creative director Daniel Kearns has reimagined the OG version in luxury wools with subtly striped collars, both in classic white and, if that feels too fancy dress, deep navy. They look best with tailored trousers or jeans and an overcoat, with or without anything underneath. Consider it athleisure for people who’d never dignify the word. On which note, high-brow designers have rescued the V-neck’s sexier side from the Love Island clones. “It showed collarless, V-neck button-front shirts that looked ultra-modern under blazers and suits,” says Down. If you’re blessed with Gosling-like looks, then you can steal his Riviera moves and style a V-necked knit au naturel. 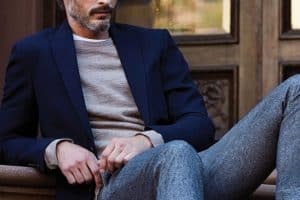 But to toe the fine line between class and lechery, stick to muted shades and fine fabrics, like wool-silk blends, merino or cashmere. And just take care not to wink at anyone. Despite having a rough go of it the past couple of winters, the one thing that has kept the V-neck alive (as far as knitwear goes, at least) is the enduring appeal of merino wool. Soft, lightweight and temperature-regulating, it’s redeeming qualities go far beyond being a more affordable alternative to cashmere. The material, shorn from the sheep of the same name, is right at home as a V-neck. Its breathable nature means it can easily slot over a shirt without causing you to sweat through on the commute. As well as the classic neutral shades, consider giving jewel tones like emerald green a go, which can break up an otherwise unenterprising outfit. Though it may not rank as highly in the world of stylish sports as tennis, cricket’s contribution to the menswear world is no less gratefully received. A close relation of the cable knit jumper (another essential knit for the autumn/winter months), this season the piece has made the transition from the field to the front row. 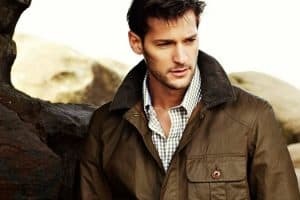 Styles rendered in thick, insulating wool are perfect for days in the depth of winter, while those spun from lighter weight cotton are ideal for tricky-to-dress-for transitional days or layering over something equally preppy, such as an Oxford shirt. You’d have to have been living under a soundproof rock not to have noticed the rise of sportswear in men’s wardrobes over the last few years. A slightly more elevated alternative to the track-top, a zip-neck sweater – ideally in a premium material like merino wool or cashmere – is an ideal way to buy into the V-neck trend without fully committing. Try yours worn unzipped with a bit of white T-shirt showing or layer under a suit jacket to bring a sporty edge to your office attire.